Use only approved containers for gasoline . . . Does anyone else ever wonder about the quality of Mexico’s single brand of Pemex gasoline versus the USA’s plethora of brands? Since Mexico has only one supplier, how can an ordinary driver make the most out of a limited field – and how might they find out if their local gas station is pumping out good stuff? First things first: without a GC or GCMS, there’s no good way to find out exactly how much detergent your gasoline has (think: PEA or the older PBA), but insufficient amounts of detergents can cause so many problems** that the US EPA has set minimum levels of detergents required in gasoline: 40 C.F.R. § 80.161 Detergent additive certification program. Since data on these sorts of things are tough to come by without your own laboratory, what can an ordinary person do to get an idea of the quality of your Mexican gasoline – and are there any simple rules of thumb that one can use to take the best care of their car’s fuel system? Our first bit of advice: Buy your gasoline from stations that have relatively new storage tanks. Since most underground storage tanks (USTs) sit at or below the water table, (especially in the Yucatan), even with cathodic protection, steel tanks rust and leak over time ~ putting gunk like in the foto above right into your car’s tank. The USA had roughly 7 decades of using (rusting/leaking) buried steel tanks, so, a culture of home-spun wisdom (along with some old-wives tales) sprung up around where to buy gas, when to buy gas, what to avoid, fuel system driers, and fuel system cleaners. Even if you buy the most expensive gasoline – typically premium that has higher octane (burns more slowly) and lower sulfur – still, the spraying, evaporation, & combustion processes in a gasoline motor are dirty. They all leave deposits** over time. These deposits gum up carburetors, gum up fuel injectors, and accumulate in combustion chambers. These problems combine to reduce performance, reduce acceleration, and reduce gas mileage. This means that peak performance is maintainedby regularly using a good fuel system cleaner. In the USA, even when buying “top tier” high quality gasoline, best performance is maintained by using a good fuel system cleaner every 7-10 (12 gal) fill-ups. 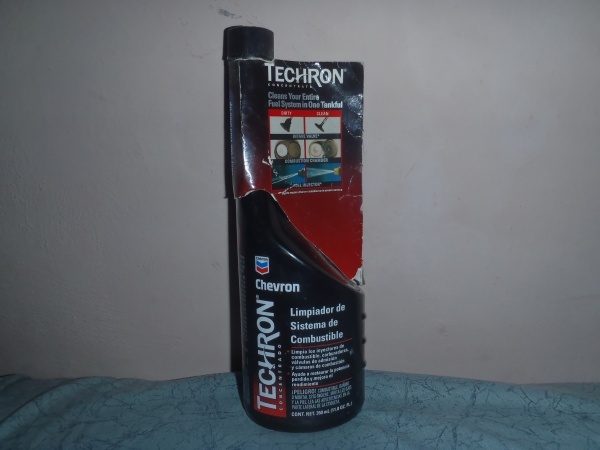 We have found that the first US fuel system cleaner approved by Mercedes and BMW is still one of the best: Chevron brand “Techron”. “Techron” is available at a number of Mexican parts stores – e.g. Autorrepuestos in Merida, but as with most quality items: Quality and high performance is not cheap. Techron typically costs $80 – $100 pesos per bottle that treats 12 gal of fuel. Cheaper cleaners simply do not work in our 40 years of experience. Techron cleans the tank, the fuel pump, the injectors or carburetor, the valves, the combustion chamber, and combustion sensors. Unfortunately, after 21 years of driving part time in Mexico, and 6 years of full time driving with Mexican gasoline, it is clear that it takes a bottle of Techron about every 3-4 tankfuls to stop hesitations, maintain acceleration, and good gas mileage. Another quality of Mexican gasoline is that it “goes bad” faster than US gasoline. Unfortunately, gasoline does have a shelf life. “Old” gasoline has lost many of its lighter volatile components, so it does not ignite as easily (making it hard to start the lawn mower or trimmer, as you yank the rope, but have less “pop”). You can reduce this problem by storing gasoline in a vapor-tight container – (which is not the typical red can). Red plastic gas bottles can be sealed by placing a piece of flexible gasoline-resistant plastic over the neck of the bottle, and carefully screwing-on the cap/nozzle. Similarly, we should maintain the vapor-tight nature of our car’s fuel systems – replacing any leaking vapor return lines, gas cap’s seals, or failed vapor recovery canisters. If you hear a nice whoosh of escaping vapor when you open your gas cap, the system is likely still vapor-tight. If no there is no whoosh, then there might be a vapor loss problem. There is another gasoline aging problem that even a vapor-tight containers and well maintained cars face: Fuel oxidizes due to contact with oxygen in air. Oxidized fuel has a distinctive “bad gas” odor that is funky and difficult to describe – but if you smell it once, it is unforgettable. There are 2 ways to avoid the oxidized fuel problem: either use the gasoline quickly enough that it does not have time to oxidize, or for stored gasoline like in mowers or trimmers, use a fuel stabilizer, like Stabil. A few ounces of Stabil is enough to keep gasoline from oxidizing for roughly a year. Mexico’s version: For some reason unknown to us, Pemex gasoline oxidizes (goes bad) faster than US gasoline. US gasoline can typically sit in your car’s tank for up to 2 months without having problems. Here, we have had Pemex gasoline go bad in as little as 3 weeks to a month. Since I only drive my pickup truck about once a week or less, my solution is to buy only $200 pesos of fuel at each “fill-up”/gas stop – unless it is used for a long trip. What’s up with that picture earlier in the article? This is what I found in just one (1) liter of Pemex gasoline. Again, only use approved containers for gasoline . . . I would guess that this station has been there at least 10 years, but was recently remodeled to look sparkly and new – so, the problem may be leaking USTs at the station, or the water and rust may be coming from some larger storage tanks used to fill the gasoline transport trucks? All I know is that I am now a bit more eager to only buy Pemex gasoline from a station that really is only a year or 3 old. 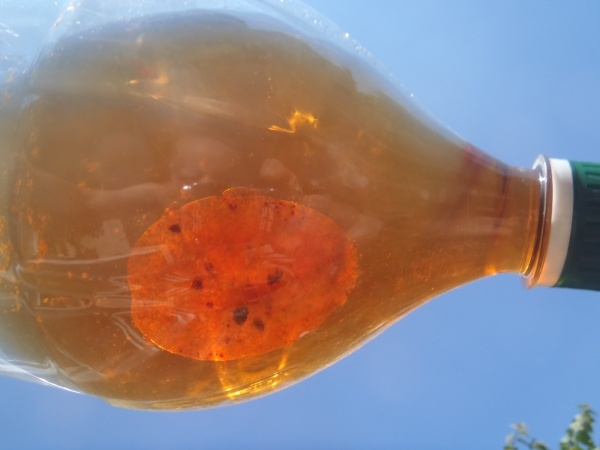 Detail oriented readers may have noted that all the solid crud in the bottle (rust and dirt?) were isolated in the water layer. Since water is heavier than gasoline, water pools at the bottom of our car’s gas tanks – and it acts as a sediment filter – trapping the nasty solid stuff in the water layer, even when shaken. This provides a visual warning for 2 other items: (1) If you run your tank completely empty – you may be sucking in 2-3 years of accumulated sediment/rust laden water into your fuel filter and system. 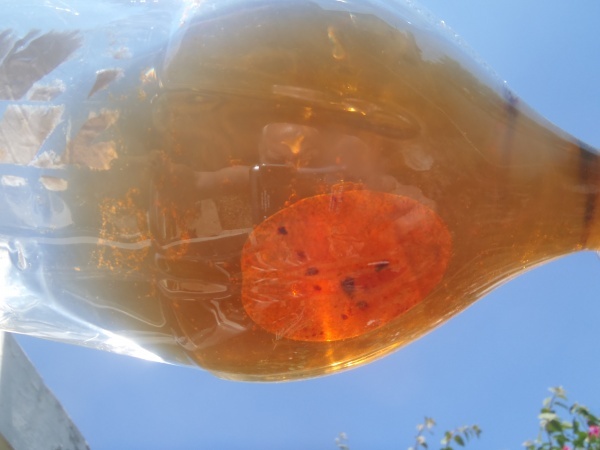 (2) If you dump a shot of alcohol (ethanol is preferable to not harm rubber or plastic fuel system parts) – like the gas dryer stuff people use in the USA, then you may release several years worth of accumulated rust/sediment into your fuel system in one shot. In either case, this can explain why some savvy travelers keep a spare fuel filter (or 2) in their car when taking long trips. Cheap insurance? Over the past few years shops have noticed that they are having more complaints about drive-ability issues including: poor fuel economy, hesitation, stalling, rough idle, hard starting, engine knock, and even misfiring. These problems are typically caused by the buildup of “varnish” deposits in fuel injectors or throttle body, and by carbon deposits on the intake valves, head, and combustion chamber. These buildups are caused by reduced amounts of detergent & dispersants – which happens at the gasoline refiners. This seems to be an issue with Mexican gasoline, but have been less frequent in the USA since the mid ’90’s, when the EPA forced refiners to add detergents to meet Additive Concentration requirements (see EPA reference above). When refiners and distributors add only minimal amounts of detergents, they save money, but it causes engine problems, increases emissions, and lowers gas mileage. Unfortunately, we have found ZERO recent government or private studies to determine fuel quality either in the USA or Mexico, so, we have no current data on the levels of detergent & additives that control deposits. Experience with Pemex gas says that its quality is not good – giving lower gas mileage even with clean well-maintained fuel systems. Fuel varnish deposits accumulate inside fuel injectors, giving poor spray pattern, large fuel droplets that do not vaporize quickly, causing engines to run less much less efficiently. In addition to rough idle, you might experience hesitation, poor fuel economy and increased HC emissions. A lean fuel mixture also increases the risk of detonation and pre-ignition. Fuel system deposits in the motor tend to form during the “heat soak” period that occurs after a hot motor has been shut off. Shorter trips and more frequent trips cause these deposits to build up faster. 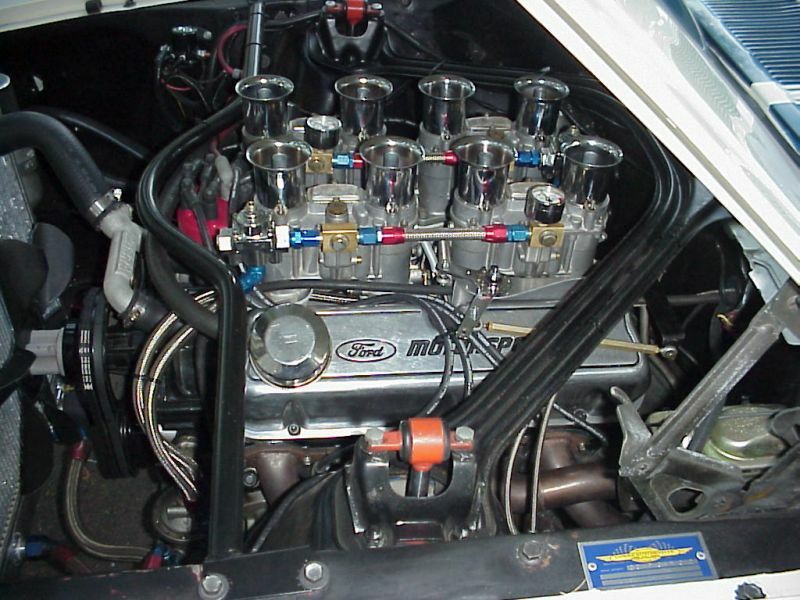 Deposits on intake valves restrict airflow through the intake ports, causing high speed power losses. The gunky deposits also act like sponges, temporarily absorbing fuel sprayed by the injectors. This “sponging” interferes with the mixing of air and fuel, causing a hesitation and reduced acceleration. Excessive deposits eventually cause valve sticking & valve burning. Typical intake valve deposits are formed by normal combustion, but they build up more rapidly if the valve guides or seals are worn and the engine is sucking oil down the guides. A single treatment with a good fuel system cleaner like Techron or BG can remove all these deposits – as noted by a blackening of engine oil after use of a good cleaner on a dirty motor. Continuing on engine deposit problems: Deposits in the combustion chamber and on top of pistons can increase the engine compression and cause the motor to need higher octane fuel to maintain performance. Carbon deposit build-up inside the combustion chamber also increases the risk of hot spots forming that can cause pre-ignitions. The hot spots ignite fuel before the spark plugs fire, causing increased combustion pressures. Modern cars have knock sensors to detect pre-detonation caused by deposits. 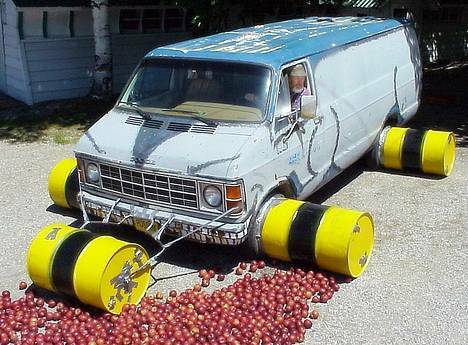 The sensors detect the problems, which the ECM/ICM (computer) interprets and then retards spark timing – stopping any knocking without the driver noticing, but retarded timing also decreases acceleration, and increases fuel consumption & emissions – which attentive drivers may notice. But that only covers Baja California. A further 2011 report on ULSD in Mexico describes: ‘Ultra Low Sulfur Diesel (ULSD) is the type of diesel fuel which has very low sulfur content. ULSD is more environmentally friendly as compared with Low Sulfur Diesel fuel (LSD). Starting with 2006, ULSD has been widely available across North America and Europe. This occurred because the countries from North American and Europe adopted new emission standards which involved extensive use of ULSD. Some countries from the rest of the world took similar measures while others lagged behind. I’ve pulled enough gas tanks and measured gas mileage enough times to know that our cars run significantly better with a good fuel system cleaner both here and NOB, but we do have to add the cleaner about twice as often here to keep fuel economy high and stop hesitations and stumbles. We drove to Yucatan this year. It never occurred to me that Mexico might still be using leaded gasoline. Yep, I continued filling the van with the green nozzle; but then one day I caught a wiff of sulphur while driving. So next time I stopped for gas I asked the guy if either the regular (green) or the premium (red) contained lead. He told me the green was leaded. 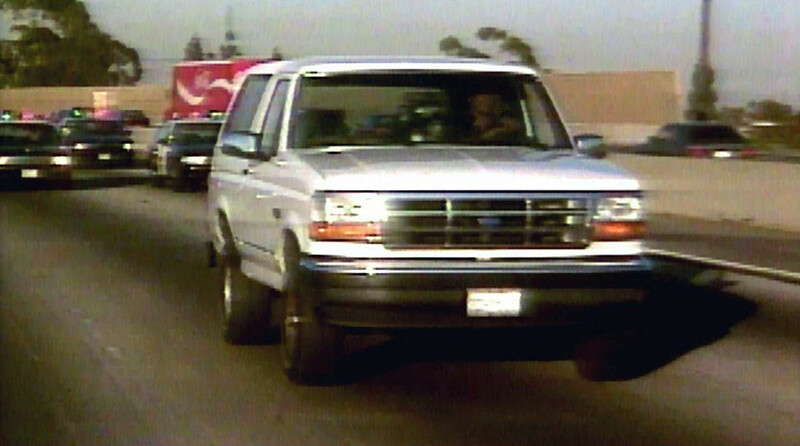 That’s when I began to wonder if I had poisoned the catalytic converter by running several tankfuls of leaded gas through it. Well, we’re back in Buffalo now; and I just took the car for inspection. I passed the exhaust examine, so I’m relieved to believe I don’t need an expensive repair. But I won’t use the green nozzle at Pemex in the future. The sulfur whiff you smelled likely came from some higher-sulfur gasoline and a slightly crapped-up fuel system, but not from any lead additives. 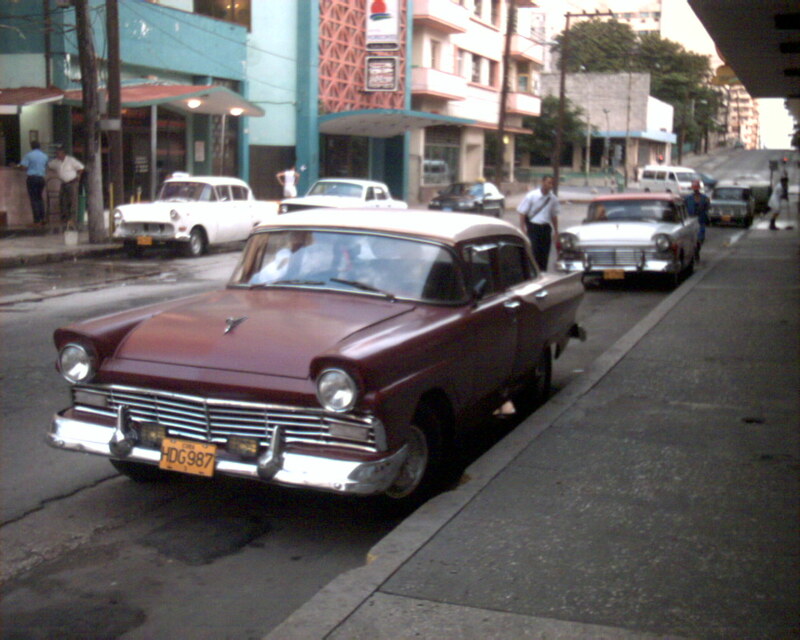 Groups that officially track lead ( like http://www.lead.org.au/fs/fst27superseded.html ) say that Mexico phased lead out of gasoline in 1998. We’ve used Magna (green handle) for the past 6 years on our 2 vehicles, and we’ve only seen issues due to fuel system deposits – issues that have been resolved by not completely filling our tanks (to use the fuel before it oxidizes and loses volatiles) and by using Techron regularly . The pump jockey obviously hasn’t stayed up to date. I’ll switch back to the green handle in the future. Steve, my sister uses diesel and has a brand new VW Golf car she is driving to Mexico. Will the Mexican diesel Pemex be OK? Are there different grades of Pemex diesel? What is best? Yes, there are 2 grades of Diesel sold in Mexico, but not every station carries them. Check for Low Sulfur and Ultra Low Sulfur Pemex signs shown above at the end of the article, since not every station carries both grades. 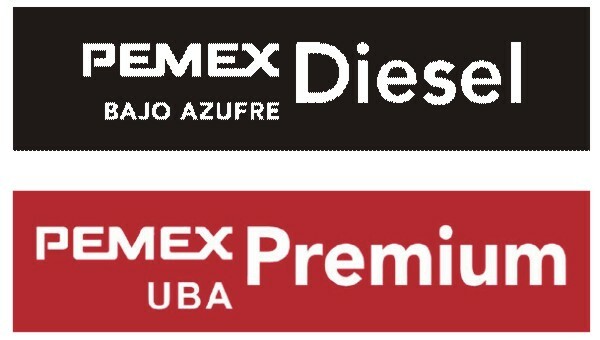 She should be using the “UBA” red PEMEX signage for ULSD in her VW to avoid damaging the TDI’s Adblue DPF system. When the USA did not offer the ULSD, Volkswagon, Mercedes et al could not sell/operate their clean diesel DPF based systems in the USA. And the diesel that is sold ON THE PENINSULA today, is it the UBA Diesel as described above? If so, that will be fine. AND….will it be labeled as such at the pump “Diesel UBA?” Thank you for your help and expertise!!! Can anyone tell me if Pemex 87 or 92 contains Ethanol and if so what are the percentages? No ethanol. Why do you ask? Adding ethanol is not cost effective – as ethanol costs more than gasoline. Adding ethanol basically offers no real pollution benefits**, nor performance benefits, as it lowers both the octane level and reduces energy content in the fuel, so Mexico has no reason to add it. The US ethanol program is paid for by US taxpayers (driven by lobbyists for big agribusiness), while Mexico follows a free-market approach versus the $10 billion a year in US taxpayer $$ in corn subsidies paid to big agribusiness. **~ If you do the math, E10 (10% ethanol) adds a grand total of just 0.23% additional oxygen to a mixture that is already 21.4% oxygen from air (using the EPA standard mixture of 14.7 grams air per gram of gasoline). So, adding ethanol to gasoline really is all about the 2 decades of lobbyist-won $10 billion of taxpayer corn subsidies paid annually to big agribusiness. Steve: Your red UBA sign is NOT for Diesel it is for Premium gasoline. Thanks! I also corrected the related text issues to fit current Pemex products. I am posting this here in the hope that someone has an answer. I am looking for bio-ethanol fuel for my portable fire place. There are lots of products available from Ebay and Amazon (usually come in quart containers) but NO one will ship to Mexico and I have been unable to find any here. I live near Merida in the Yucatan. Does anyone know where I can purchase any. Thanks!!! I am a journalism student at the University of Arizona working on a story about gasoline quality between the U.S. and Mexico. I wanted to know if there were any differences between the two countries’ gasolines? I know that border states have similar prices, but I wanted to know if Mexican gasoline is an equal competor with the U.S. ? What do you know about American gasoline? To compare American gasoline to Mexican gasoline, you need to know about each of them. e.g. How does American gasoline vary between different regions of America? What is a motor octane versus a research octane rating? What is a Reid Vapor Pressure (RVP) for gasoline? What differences are there between different American gasolines with different RVPs? How and why do RVPs change between winter and summer gasolines in the USA? How are gasolines in the Rocky Mountains different than gasolines in the Deep South? How and why do gasolines differ between different refineries in the USA? How do Shell gasolines differ from Chevron’s gasolines differ from El Cheapo brand gasoline? What does aromaticity have to do with the qualities of gasoline? Where are Mexican gasolines refined? Hint: most Mexican gasoline has been refined in the USA in the past… Why? and Where? Then: Check out gasoline refineries for CFE – in CFE’s annual reports. What basic types of hydrocarbons make up different gasolines? What gives gasoline its distinctive smell? How does gasoline’s smell change as it ages? Why? When you can answer those last 4 questions, then you can begin to explain/understand how Mexican gasoline differs from US gasoline (it’s not necessarily the “question of quality” that you ask – and you can explain why typical Mexican gasoline ages differently (more rapidly) than common US gasolines. e.g. If you wanted to preserve gasoline, what would you use? … Why? I have a 2004 TDI Beetle..I am planning a trip to Loreto, B.C.S. Will I have any Diesel Fuel issues? When storing quads trucks for 5 months using Pemex gas do I need a stableizer to the fuel ? Or should just fill to the top of gas tanks with no stableizer? I’ve been told that if you use a fuel conditioner in your tank it will gum ,please can someone shed some light on this thank you . We’ve successfully been using Stabil since the 1960’s to stabilize stored gasoline, and never found a problem, whether with 2 cycle, 4 cycle, trucks, cars, boats, lawnmowers, power tools, generators etc. Stabil has worked well with Mexican gasoline, with NO residues or gum appearing in stored gasoline in clear containers on and off over the last 12 years. It’s available at Auto Zone. Thank you that gives me confidence now !